Matt Crooks says the Cobblers fans are in for a treat once new signing Kevin van Veen gets over his injury problems and finds his feet at Sixfields. The striker was signed for an undisclosed fee from Sky Bet League One rivals Scunthorpe United last month, but has suffered a frustrating start to his Town career. After a substitute appearance in the 1-0 loss to Rochdale at the beginning of February, the Dutchman made his full debut in the 3-1 win at AFC Wimbledon, but hasn’t featured since. A knee injury picked up at the Cherry Red Records Stadium has seen him miss the games against Gillingham and his former club Scunthorpe, and he is also set to sit out this weekend’s big clash with Oxford United. Van Veen underwent a scan earlier this week that showed he has damaged a medial ligament, and it is not yet known when he will be back in the claret and white. But when he does return, Crooks, who played with van Veen while on loan at Scunthorpe last season, believes the 26-year-old will have a real impact. “Kevin is tall and is a good build, he is clever on the ball and he has good movements,” said the former Rangers midfielder. “He can score some unbelievable goals, and is a very good striker and a very good player. 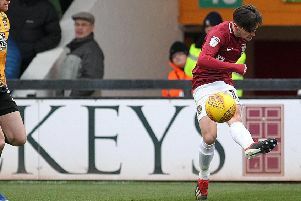 In van Veen’s absence at Glanford Park on Saturday, the Cobblers claimed a 2-2 draw thanks to strikes from Chris Long and John-Joe O’Toole, who are making a habit of scoring crucial goals for the club. The frustration from the day for Town was that they twice let a lead slip, but Crooks believes it was still a positive result for Jimmy Floyd Hasselbaink’s men. “Scunthorpe are a good team, they are in a good position, so it is good to go away and gain a point,” said the 23-year-old former Accrington Atanley man. Crooks returned to the Town team at the weekend, having, missed the midweek loss to Gillingham due to a tight hamstring, but the player insists there is nothing serious to worry about. “My hamstring was a bit sore, and I have had a bit of a problem with it for the past few weeks,” said Crooks. Crooks will be fit to face Oxford on Saturday, while right-back Shay Facey is also expected to be available having returned to full training after his hamstring strain. Hildeberton Pereira is alaos available for selection having served the one-match ban for his sending-off against the Gills.